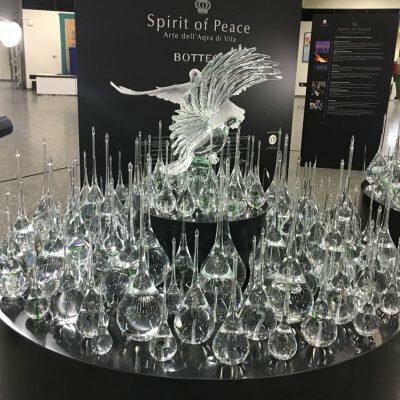 “Spirit of Peace” is the art exhibition developed by Sandro Bottega with the municipality of Hiroshima and the support of the mayor Kazumi Matsui to spread and promote a message of peace. It is a collection of artistic blown glass pieces designed by Sandro Bottega and created by the masters glassblowers at the Alexander Bottega artistic glassworks and by Master glassblower Pino Signoretto from Murano, Venice. From 19th to 23rd November the exhibition is held in the Rotunda of Vienna International Centre on the occasion of the meetings of IAEA: Board of Governors: Technical Assistance and Cooperation Committee.